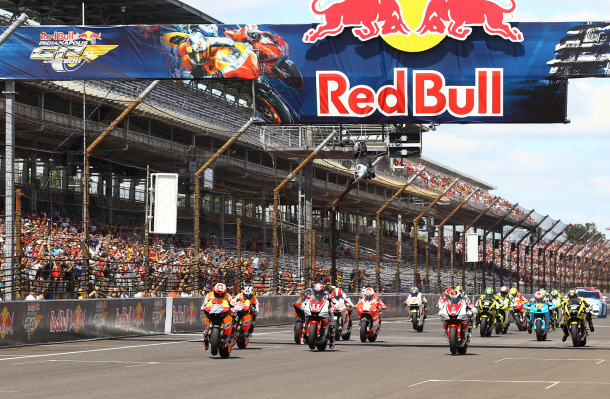 After the helding first on the 2008 Red Bull Indianapolis Grand MotoGP is a part of world motor cycle championship. Marc Márquez is the top 4 times winner of the contest and Honda as menu facture is the top 6 times winner of its. The tournament venue is Indianapolis Motor Speedway which known as Indianapolis Grand Prix. At 2015 this will be held up at Friday, August 7– Sunday, August 9. Total length of the circuit is 4.2 Km or 2.59 miles and its longest Straight is 872 m. or 2860.89 ft.
Red Bull Indianapolis Grand MotoGP circuits have 10 left corner and 6 of its right, total lap of it is 30. Longest Straight : 872 m. or 2860.89 ft.
Before the 10th title of the championship around the year, Valentino Rossi in the top with 3 wins, 2 Moto2 and 4 Moto3. Last year champion Marc Márquez is the 4th before Red Bull Indianapolis Grand Prix. Marc just finished from 1st at the 9th grand prix in Germany. Which was his 2nd 1st title of the year.